Tattooist since 2006, and studio owner. Erik’s most recently published tattoos and artwork can be viewed on his Instagram account @tattoosbyerik. Erik is in the studio Tuesdays through Fridays from noon until 8pm. To set up a consultation with Erik, please call the studio at (479) 254-9270. Emerson’s most recently published tattoos and artwork can be viewed on Emerson’s Instagram account @thathepcatheathen. Emerson is in the studio Mondays through Fridays from noon until 6pm. To set up a consultation with Emerson, please call the studio at (479) 254-9270. Art is my passion. During my childhood, if anyone needed anything art-related, I was their go-to. I graduated–with honors–from Memphis College of Art with a bachelor’s in Illustration. Shortly after, my husband joined the Navy, and I moved to eastern Connecticut. I found an apprenticeship a state over in Rhode Island at Dragon Lily Tattoo. While I worked there, the shop as a whole won best tattoo parlor in RI two years in a row. I’ve been tattooing for about two and a half years now with a current license. And I built up a good portfolio along with a clientele during my short time there. I’ve also tattooed in two conventions, and I’ve attended as many seminars as I could afford. As for my art style, I tend to be very illustrative and colorful, but I am adept in a variety of styles such as portraiture and black and grey. Cover-ups are another area where I’ve had a lot of experience. Victoria’s most recently published tattoo work can be seen on her Instagram page @maxwell_victoria. Victoria is in the studio Wednesdays, Fridays, and Saturdays from noon until 8pm. To set up a consultation with Victoria, please call the studio at (479) 254-9270. Seneca’s most recently published tattoos can be seen on his Instagram page @bignastysmokes. 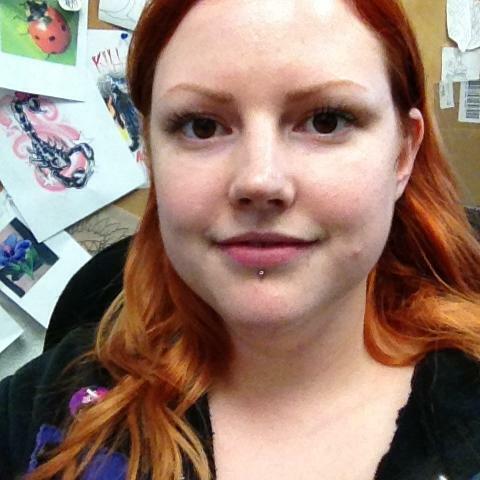 Seneca is in the studio Wednesdays through Saturdays from 3:30pm until 8pm. To set up a consultation with Seneca, please call the studio at (479) 254-9270. Kaerina’s most recently published tattoos can be seen on her Instagram page @kae.rina.art. Kaerina is in the studio Mondays through Fridays from noon until 6pm. To set up a consultation with Kaerina, please call the studio at (479) 254-9270. Each artist primarily uses Eternal Ink. 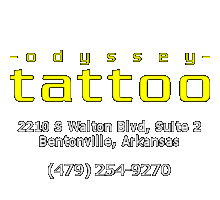 Odyssey Tattoo, 2210 South Walton Blvd, Suite 2, Bentonville, Arkansas 72712 U.S.A.
©2005-2018 Odyssey Tattoo. All rights reserved.